Radio420™: Oracle of the Three Rings (Into the Echoside expansion) to be released at DCG Con! 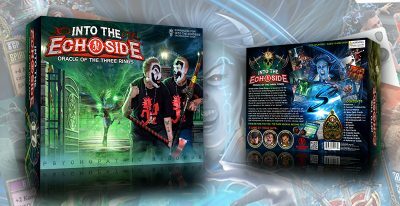 Oracle of the Three Rings (Into the Echoside expansion) to be released at DCG Con! There was a huge announcement made tonight at DCGCon.com! We have been promised an expansion pack for Into The Echoside for what seems like forever now! It was rumored to be released at the Gathering, but never came to fruition. That is about to change though! The Oracle of the Three Rings is almost here, and will be ready to be released at this year’s DCG Con! We’re talking 120 Brand New Cards, and if you purchase the expansion pack at the con, you’ll get a DCG Con EXCLUSIVE Shaggy Show Flavor Card! Check out the info below!